By Darren Starwynn, O.M.D., D.D. This brief essay is intended to help professionals who want to get involved with the practice of microcurrent therapy and microcurrent electro-acupuncture in wading through the often confusing information encountered when investigating this subject. By its very nature, electro-therapy tends to be difficult to understand for most health professionals. Few have training in electronic theory and parameters, physics or the Universal Laws of energy that clinical success or failure are based on. Most manufacturers of clinical stimulation devices offer very limited training and instruction, based on simplistic and relatively ineffective techniques of application. 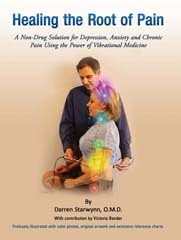 I’m sure that the intentions of the people who write electro-therapy training manuals is to keep the information as simple as possible, but the vast majority of the instructions given consist of placing electrodes right over locally painful zones and stimulating these with currents that are usually way too strong for optimal response. While this is a simple concept to grasp, this is not what usually leads to superior clinical results. Microcurrent devices are those that output therapeutic currents regulated in the millionth of an amp, or microcurrent, range. The success and popularity of microcurrent electro-therapies are based on frequently superior patient responses. This is due to the fact that most of the human body’s innate electrical activity occurs in the pico (trillionths) and nano (billionths) of an amp range, and in some cases reaches the microamp range. Readjustment of these extremely subtle fields is better accomplished with currents that are just slightly higher than the innate currents. The high-intensity milliamp currents output by most electro-therapy devices are truly an ‘overkill’ response in most clinical cases, although some acute conditions presenting muscle spasm, gross edema and severe pain do require this overkill response for first aid purposes. Even when milliamps are useful, it is advisable to immediately follow with subsensational microcurrents to ease the body down from the distortions induced by the high intensity current intervention. Therefore, a device that offers both milli and microcurrents, in sequence, will be most clinically useful for acute conditions. This would allow you to give a patient brief milliamp treatment followed by a longer period of microcurrents, preferably without you having to come back to the treatment room to change parameters. There are two main mediums to apply microcurrents to the body – through probe electrodes and pad electrodes. Probe electrodes have very small contact points, and so are ideal for stimulation of trigger and acu-points. Quality devices also allow location of acu-points through a probe system using an ohmmeter feedback system. We have found many of the most impressive results with microcurrent therapies to be with specific point stimulation. It is far better to purchase a microcurrent device that has a well-crafted dual probe system that allows two points to be stimulated at the same time, and allows for accurate searching and location of low-resistance points. Look for a device with both a visual and audible feedback system. The visual meter is most useful when you can read the specific scale from 0 – 100, rather than just a sound or row of LED indicators. The leading edge of microcurrent therapy is in the combination of microcurrent with other vibrational medical modalities. When properly selected each can amplify the results of the other, thus allowing for very rapid patient responses and longer carry-over of pain relief, facial lifting or Organ balancing. The most exciting such combination is frequency-specific microcurrent and color light therapy. A device that allows you to apply these simultaneously to acupuncture and trigger points will be a much better investment than any microcurrent-only system. As a whole-body treatment system, microcurrent therapy is often advantageously applied to multiple body areas at the same time. Ideally, probe treatment should be simultaneously available as needed. Superior devices have four output channels to allow for this flexibility of treatment. One of the most useful styles of pad treatments is called interferential electro-therapy. This is a four-pad set-up, with each set of two pads set to slightly different frequencies. Interferential currents have the advantage of broader and deeper penetration into the target tissues of the body. It takes two output channels of your device to create one interferential pattern. A four-channel unit will allow for two of these fou-pad set-ups, which is frequently called upon in clinical practice. Some examples would be treatment of both knees, neck and back injuries treated together, peripheral neuropathy, or simultaneous treatment of two or more patients. One of the most severe drawbacks to many microcurrent stimulators is lack of control over current polarity. The Law of Polarity is a universal principle of physics that requires effective energy stimulation to the human body to be accord with its natural polarization. In my teaching career, I have found that the in the majority of times practitioners have reported clinical failures or aggravations to me, the Law of Polarity was not being followed. Again, in an attempt to simplify the use of electro-therapy, many manufacturers have only offered fixed biphasic (alternating polarity) currents. Such currents are appropriate for local dispersion of energetically blocked areas, but are not very effective for disorders of the extremities, acupuncture meridian treatment and balancing, neuropathies and headaches. In these cases, properly polarized treatment currents are essential. I do not recommend the purchase of any microcurrent device that lacks adjustable polarity. One of the factors clinicians must deal with in applying any form of stimulation to the body is accommodation. This is the tendency of the body to quickly adapt, and thereby tune out, any repetitive input. This is what happens in a noisy restaurant- you rapidly cease to be as aware of the backround noise. If some unusual and new sound reaches your ears, however, you will again sit up and take notice, as it is a departure from the drone you have accommodated to. This new sound that grabs your attention is a form of modulation, or disruption of repetition. 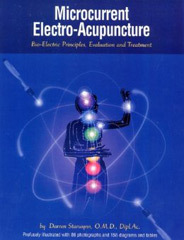 This principle is important to understand in the practice of electro-therapies as well. Most microcurrent devices only offer repetitive currents. Once a frequency and intensity is selected, that will continue for the length of the treatment. As just explained, the body is likely to accommodate, thereby rendering most of the treatment ineffective. I suggest purchasing a device that offers several types of current modulations that helps prevent accommodation. There are several valuable modulation patterns, some better for acute conditions, and some better for sensitive, chronic patients. As you can see from reading this far, there are a lot of variables to understand in applying effective microcurrent treatment. You may be a technophobe who does not want to delve that deeply into study of electronic parameters and how to select them for each clinical presentation. The good news is that some devices exist that can be simply programmed through presets. The microprocessor technology of superior devices allows a clinically effective set of parameters, including correct frequency, polarity, intensity, modulation, waveform, etc., to be selected with a single action, such as pressing a button. Look for a device that offers a broad range of preset treatment protocols, yet also allows you to customize the presets if you want. As your skill and confidence grows, you will probably want to be able to set up your own presets or alter those programmed by the manufacturer. Finally, one of the most important factors in this discussion is the amount and quality of support and training you will receive from the company selling you your device. As mentioned earlier, few companies have the knowledge or inclination to adequately train people purchasing electro-medical devices from them. In most cases, the salesperson has only a sketchy knowledge themselves, and once his or her commission has been earned, is not inclined to continue the learning relationship. Ask any salesperson wishing to sell you a microcurrent device exactly what kind of training program his company offers, especially after the sale is completed. Good training materials, personal support, access to help and ongoing seminars and briefings are of tremendous value. A good program of this kind is potentially worth thousands of dollars to you in increased revenues through greater clinical successes and the resulting new patient referrals. The combination of a versatile device with the features suggested above and a comprehensive training and support program will go a long way to ensure your clinical and business success. Although you may pay more for a superior device and training program, this difference will come back to you many, many times over, and is truly a smart investment rather than an expense. In fact, investment of money and time into acquiring and learning to use a quality microcurrent stimulator is an excellent example of business leverage.